Do you really need a Store Locator with all the Smart Search Engines that exist today? Well, let’s dive into the real reasons why Store Locators work and Search Engines don’t, when it comes to locating products or services locally. Type a search term into google that you feel might be local to you. Such as a Plumber or A/C Repair. You’ll get some results that are companies local to you. Makes sense. In fact it’s very smart and does a great job of determining when you are searching for a person, place or thing that can be classified as a local entity. 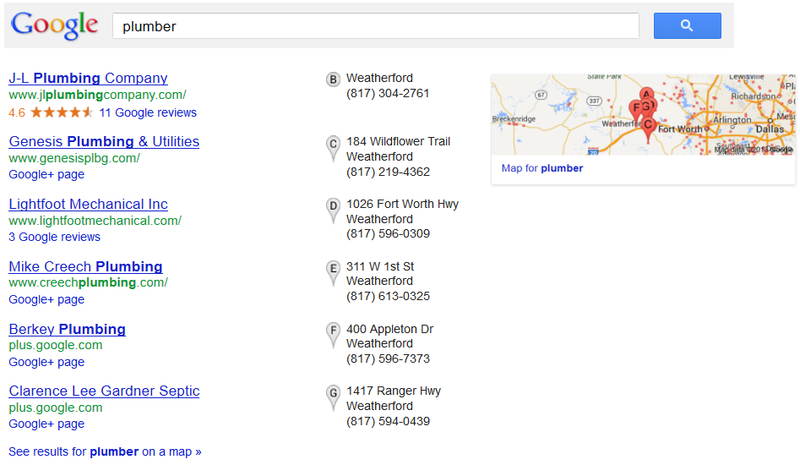 Searching on the term ‘Plumber’ will get you a list of local plumbing companies. Which is great. We just happen to need a plumber that is in our town versus in another state. Good job google! If you are a company that makes candy bars, and you are in 3,000 stores across the country, should you leave it up to google to act as your store locator? Google happens to already know all the store addresses and phone numbers where your visitors are searching for, right? The answer is: No! Google might be aware of the physical location addresses and phone numbers where your products are sold, but google has no way to determine if your candy bar is on the shelf at that location. Google has no way to determine if any location is an approved stocking dealer or vendor. Google can list the location’s information, but it can not tell if they are in your network of distribution. So, unless the consumer already knows a particular dealer/vendor of your product and searches for that particular store, then google can’t help us. So Who Is Responsible For Letting Customers Know Where Products And Services Are Available? Only the manufacturer of the candy bar knows where the candy bars are distributed and sold. The manufacturer is the only entity that can truly distribute the distribution channel accurately. You don’t want your customers searching high and low for your product or service. Implementing a Store Locator system is the only way to efficiently broadcast your locations reliably. Put yourself in the customer’s shoes… You want that new double chocolate almond bar that you saw on TV last night. It looked really scrumptious right? You have no desire to drive all over God’s Green Earth to find it. So you head out to the old InterWeb to search for it. You visit google and search for ‘double chocolate almond bar’ and it returns the manufacturer’s website as a perfect match. Remember, searching for specific terms not related to local places, will not return local matches. When the customer gets to the manufacturer’s site, there needs to be a fast way for this customer to find the store nearest them that carries the new candy bar. Google simply can’t do this. Only the manufacturer can. This is the reason Store Locator systems are implemented on most websites that exist today. Especially if the company has a product or service that is available in multiple locations. It’s the reason why the ‘Find a Store’ link is always at the top of the homepage. Customers use locator tools to help find the closest location where they can obtain possession of your product or service. It is your job to insure your customers can find your products or services locally. Implementing a Store Locator at your site is the only solution that works and is proven. Consumers visiting your site expect to find a Store Locator tool available because it’s now commonplace to have one available. If you find yourself needing a new Store Locator tool for your website, be sure to checkout the www.UltimateLocator.com service.